Solar Hot Water Systems are a great option to help dramatically reduce your energy costs. Heating water is a major energy user in most homes, consuming up to one-quarter of your annual energy supply. With solar hot water systems, you can realise all of the benefits of free energy from the sun, and use/store this energy in your hot water storage tank. Infinite Energy offers two different types of systems: evacuated tubes and flat plate collectors. The sun’s thermal energy is absorbed by an array of robust cylindrical tubes installed on your roof. Inside each tube is a small amount of evacuated purified water with a boiling temperature of 30°C. Once heated via sunlight, this water turns into vapour and rises to the top of the tubes internal heat pipe. The array of tubes is connected into a central manifold, where the water from your storage tank runs through. This water is super-heated and returned back to the storage tank hot and ready. Once the vapour has transferred all of its energy and returns to a liquid state, it runs back down to the heat pipes, and the process begins again. Flat plate collectors feature copper pipes that run through a glass covered collector. The sun heats up the copper pipes which are full of water. The resulting hot water is thermo-siphoned between the panels and the storage tank, gradually heating up the water. Flat Plate Collectors are often connected to a water storage tank on the roof. Up to an 80% reduction on your water heating bills. When coupled with solar panels, your savings could potentially increase. Increase in the value of your home. 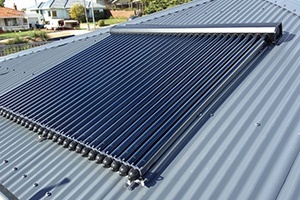 Under the Small-scale Renewable Energy Scheme, solar hot water systems are entitled to a number of small-scale technology certificates (STCs). An STC is a calculation of how many megawatts of energy your solar hot water unit is expected to save over ten years, when compared to the electricity consumption of an equivalent electric water heater. For example, a 400 Litre Apricus Tank is expected to produce approximately 46MwH of energy over 10 years. This means you are entitled to 46 STCs. STCs currently trade for around $38 each, which means you’d receive around $2,208 off the upfront cost of the unit. 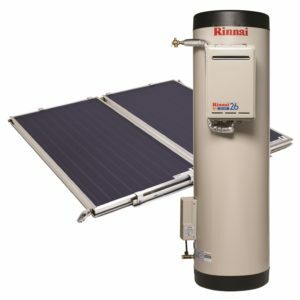 Infinite Energy stock Apricus Evacuated Tubes and Rinnai Flat Plate Collectors, two of the most efficient solar hot water systems on the market. Our experienced energy consultants will advise you on the best type of solar hot water system for your home, budget and lifestyle. Request a no obligation consult by clicking here, or call us on 1300 074 669 to chat with one of our expert energy consultants.